Every second, minute, and hour of each and every day there is a struggle going on inside each and every one of us to keep things running smoothly, and the key to vibrant health and wellness is keeping our pH in balance. You may be wondering what pH balance is. Well, pH is the abbreviation for ‘potential of hydrogen’ and is a measure of the acidity or alkalinity of a solution. It is measured on a scale that ranges from 0 to 14. The lower the pH the more acidic the solution, and the higher the pH the more alkaline the solution. When a solution is neither acid nor alkaline it has a pH of 7, which is neutral. Our body needs to have a balanced pH or it will not function properly. The alkaline level is very important because, as research has already proven, disease cannot survive in an alkaline environment but will flourish in an acidic one. If we are experiencing health issues, it is most likely because we are too acidic. For instance, the cells in our body cannot function properly if our blood pH balance varies too far from the narrow range of 7.35 to 7.45. Our body will go to great lengths to maintain this level, and do all it can to prevent its own breakdown. Research also shows that unless our body’s pH level is slightly alkaline, our body cannot heal itself. If our body’s pH is not in balance we decrease the ability to absorb minerals and other nutrients, decrease the energy production in the cells, decrease the ability to repair damaged cells, decrease the ability to detoxify heavy metals, make tumor cells thrive, and make us more susceptible to fatigue and illness. Our body’s pH affects everything. An acidic pH can occur from toxic overload, emotional stress, immune reactions or anything that deprives the cells of nutrients. But the primary cause of an acid medium in the body is from what we eat and drink. And it has nothing to do with how the food and drink tastes in our mouth. Foods that are sour such as grapefruit and limes can taste acidic, however, upon ingestion break down into a base-forming alkaline “ash”. “Ash” is the end product, which remains in the body after the food has been broken down through digestion. Foods which produce an alkaline ash are classified as “base-forming” foods, whereas those producing an acid ash are considered “acid-forming” foods. Fortunately, it’s easy to change the pH level of our body almost immediately and make it more alkaline. It’s a matter of changing our diet. Food is the means of replenishing the alkaline in our body, so by eliminating most of the acidic foods in our diet and adding more alkaline foods we can turn ourselves more alkaline. One of the best ways to immediately begin changing our pH is to drink “green drinks”. It is well know that a diet rich in greens will help increase energy, improve our health, and help us heal, and there isn’t a more convenient way to get the greens we need than with a live whole food concentrate such as AIM BarleyLife®. 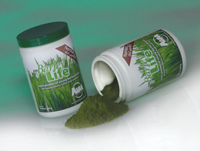 AIM BarleyLife® is made from the juice of young barley grass and is loaded with vitamins, minerals, enzymes, antioxidants, phytochemicals, protein, amino acids, and chlorophyll. Barley grass juice has a neutral pH of 7.0 and provides alkaline minerals that ‘buffer’ or neutralize acidic materials, which helps our body maintain a steady pH balance of body fluids. AIM BarleyLife® will help support our health by providing us with the necessary nutrients to help balance the body pH and is an excellent source of alkalinity. We may not be able to control the toxins we are exposed to on a daily basis, or the stress we incur in our lives, but we can certainly make a conscience effort to have a healthy diet and get more exercise. Because the primary cause of an acid medium in our body is caused from what we eat and drink, it makes good sense to eat right, stay fit, and enjoy a green drink. Acid or alkaline—what side are you on? Click here to learn more about AIM BarleyLife®, where you can read more, download a datasheet, watch a video, and make your purchase. As with any nutritional supplement it is always recommended to read the literature thoroughly to find out if the product is right for you, and consult your health care practitioner if you have any medical conditions or concerns. A quick way to estimate what is happening in your body tissue is to test the pH of your urine or saliva using the AIM pH Test Kit, which contains 100 easy-to-use strips that provide accurate pH readings. As you make dietary changes, measuring your pH on a regular basis is an excellent way to check that you are maintaining a balanced body. 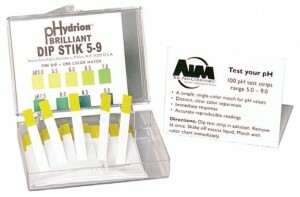 You may order the pH Test Kit when placing your BarleyLife purchase (pH Test Kit, code 4656E, $12.50).